Though behind the scenes, Edgar Bennett has been involved in perhaps the biggest question mark of Green Bay's season thus far: who will fill Ryan Grant's shoes? The question has yet to be emphatically answered by any of the backs on the roster, which means the recent arrival of James Starks from the PUP list has everyone asking the question: can he be the guy? Watching film of him in college suggests he could be, but the nearly two years of football he's missed due to injury casts a rather large shadow over his potential. He has a lot of catching up to do if he's going to contribute at all this season, and it all starts with fundamentals: pad level, pass blocking, and holding onto the football. Thankfully, Edgar Bennett is the running backs coach, and there's no one better to teach him. Bennett holds a special place in Green Bay Packer history. After Terdell Middleton crossed the 1,000 yard plateau in 1978, there was a rather long stretch where no Packers running back achieved that feat. Bennett broke the floodgates open, and over the past 15 years the Packers have only missed the mark four times. Bennett was never pretty. He was part of Ron Wolf's first draft class, a fourth-round fullback out of Florida State in 1992, and even after being converted to halfback his running style often reflected his roots. But Bennett's fundamentals were strong. 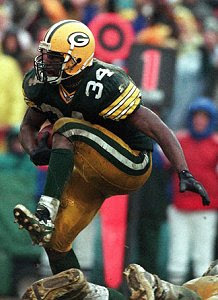 Each season he earned more touches, until 1995 when he gained 1,067 yards. And he did it averaging a mere 3.4 yards per carry. But Edgar's strength was never running for long yardage--it was in all the other things a back has to do. His trademark play was the screen, and he caught 61 balls in '95, making him the second leading receiver on the team. Even after Dorsey Levens emerged as the team's lead back in 1996, Bennett remained the 3rd down back thanks to his strong skills as a blocker. Though he was never the fastest on the field, he was a sure-footed, square-shouldered, north-south runner, which always came in handy when the field got sloppy late in the season. And he rarely fumbled. Perhaps his best game came in the '96 season against the 49ers. The scene was Green Bay in the playoffs, and it was unseasonably warm and rainy for January. The field was a mud pit. Bennett shied away from his "mudder" moniker, but after he ran 17 times in the rain for 80 yards and 2 TDs in a literal mud pit at Lambeau Field that day, his reputation was sealed. And though that was the last game he really starred in, his career in Green Bay turned out to be far from over. Coaches are rarely stars--they're usually the try-hard guys who alway studied the game to make up for their lack of natural ability. That's why Bennett is a natural coach, and when Mike McCarthy came to Green Bay with his mission statement of bringing in "Packer People," it was no surprise that Edgar Bennett was one of the few coaches he retained from Mike Sherman's staff. But let's take a minute to appreciate Edgar Bennett. Workhorse. Fundamentally sound. Not flashy yet effective. Thrived in bad weather. And he came home to coach. Plenty of stars have come and gone since Ron Wolf and Mike Holmgren turned the Packers back into a winning franchise--from Brett Favre and Reggie White to Aaron Rodgers and Charles Woodson--and all of them are more recognizable than Edgar. But I don't think any of them represent Packer Football better than he does.